A charity has been set up to support the remaining Green Cabmens’ Shelters so no more are lost. Here is a map and list showing just how many have been lost over the years. This cabmens’ shelter in 1904 London gives some idea of the modest dimensions of cabmen’s shelters. 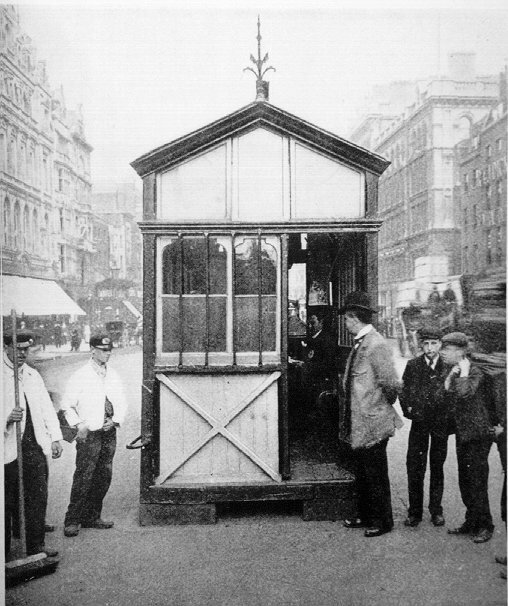 This picture is of a cab stand close to Harrod’s, about 400 yards from the present location of the Thurloe Place cab stand and shelter (see below). Since two shelters would not have been built so close together, the cab stand and shelter must have been moved to Thurloe Place sometime after 1904. Many cabbie huts were destroyed in the Blitz and with the subsequent post-war redevelopment and road widening the shelters went into decline leaving only thirteen. They soldiered on with TGWU and GLC help. When the GLC folded, the bacon butty was passed to the Heritage of London Trust, which has underwritten the renovation of all but two of the shelters, at a cost of £25,000 each. They are now Grade II listed buildings and protected by English Heritage. One shelter which stood at Hyde Park Corner until it was pulled down to make way for the Piccadilly Underpass was often frequented by polar explorer Sir Ernest Shackleton. The regulars, prior to his last expedition, presented him with a set if pipes and a pipe rack. He died at sea but his letter thanking them hung on the shelter wall until its demolition. These unpretentious green huts that have sustained London cabbies for more than 130 years are to get a new lease of life, thanks to a £69,000 grant from the Heritage Lottery Fund. On 27th September 1966 The Cabmen’s Shelter Fund was registered with the Charity Commission: Registered charity number 236108. The shelters are now run by tenants who pay a contribution to the Charity to maintain the shelters, and still sell hot drinks and sandwiches. This charity endeavours to keep the remaining shelters in good order. If you have a query about the shelters including permissions to film or photograph inside any of them, please contact Jimmy Jenkins at the Fund’s website. If you wish, you may contribute to this charity by using the donate button at the top right corner of this page. I am indebted to Jimmy Jenkins and Alf Townsend for providing me with the locations of many of the lost shelters. I hope more will be added as we discover their lost locations. 1875 Vauxhall Station – One of originals moved? 1875 Harrow Road – One of originals moved?